I live in a state with frequent air pollution issues during the winter, and throughout my life have started to feel the effects of it in the development of seasonal asthma. My state is known for producing lots of asthma sufferers! Recently, I've been involved in doing some hobbyist-level air science, thanks in no small part to my friend Brad Midgley and his Geothunk project, which really helped me get started. I've been more closely monitoring our indoor air. It's really fun! 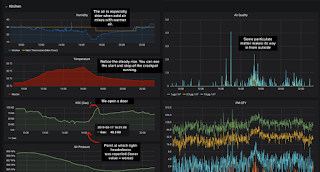 For the technical details, I've deployed several sensors in and outside of my house to monitor PM levels (particulate matter, IE smoke, dust, pollen, mold, etc), humidity, VOCs (volatile organic compounds), temperature, and air pressure. I record values every 30 seconds and ultimately log them to a database, InfluxDB. Then I visualize and expore the data using Grafana. All of this infrastructure runs in my basement on a Raspberry PI with USB RAID controller for storage. I've learned a lot of things by watching our data and learning what kinds of things contribute to different pollutants. While none of my discoveries are new discoveries, it was fun to discover them, and, I'm not sure they are common knowledge. PM (Particulate matter) levels. Primarily, PM1, PM2.5, and PM10. PM2.5 particles are hazardous for our health because they are too small for your mainline defenses, since the cilia in lungs cannot deal with them . This means our immune system has to deal with it. And how? Inflammatory reactions. Inflammation in our lungs over an extended period of time will lead to tissue damage. The kind of tissue damage, I think, that leads to statistically increased rates of lung and cardiovascular disease in more polluted areas. VOCs are vapors in the air that can cause the room to feel stuffy. Some common sources are living creatures, decaying plant matter, cleaning products, fumes, etc. They accumulate the worst in poorly ventilated areas, and while some are actively harmful to your health, at a certain level of saturation it will be more difficult to breath, since the vapors will crowd out the available oxygen. People with impaired lung capacities (Asthma, COPD, etc.) will notice high-VOC concentrations earlier than others, since their lungs absorb oxygen less efficiently. We have an essential oil diffuser from döTERRA, which some household members use to put essential oils in the air. While these devices are purchased and used for purported health benefits, I found that these things, when used with tap water, are much worse polluters than I'd imagined! Would you like a side of lung-injuring particles with that? In the above graph, you can see pretty clearly when the diffuser was turned on, at about 23:05. It was running in our master bedroom (~40 square meters total). In 30 minutes, that innocent looking device converted the air in our bedroom up to 25 PM2.5 μg/m³. I stopped the diffuser for this repeat-experiment; however, in the past I have seen levels of 50-75 PM2.5, a level well above the limit per the EPA 24-hour fine particles standard for outdoor air  (no indoor standards have been set by the EPA yet). This effect is not limited to diffusers; any humidifier that use an ultrasonic mist maker will happily convert the mineral content in tap water into fine particulate matter. If you own and use any ultrasonic mist humidifier / diffuser devices, use water with the mineral content removed, such as distilled water or water filtered by reverse osmosis. It's a potential misconception to think that manufacturers recommend distilled water just to help protect the humidifier equipment. Really, you should be more worried about protecting your lungs. If a humidifier says it's "filter free" because it kills bacteria, this says nothing about the pollutants it will put in the air. Don't put mineral-containing water in ultrasonic mist humidifiers or diffusers. As an alternative, if you want convenience of using tap water, boiling humidifiers can be a better, more convenient choice since they leave minerals behind in the water (which is why the water will turn black after several runnings without cleaning). However, aside from the fact that this will heat your home (a fine side effect during the winter), another fun fact is that tap water also contains VOCs (volatile organic compounds) in it (as seen in a city water report, IE ). When you boil the water, these organic compounds are released into the air. VOCs, in high quantities, can crowd out the availability of oxygen and can make the room feel stuffy and make it more difficult to breath. This effect is made worse by the fact that humidifiers usually require the windows and doors to be closed for them to do their job. Personally, for a boiling humidifier, I find that targeting 35-45% humidity is a nice compromise between convenience, keeping my room from getting too dry, and keeping the VOC levels under control. Slow cooking meats, indoors, in a crockpot, can create hazardous air situations as meat releases VOCs when it is cooked (all that delicious smell!). If you're not ventilating well (because, for example, it's cold outside), you might consider cooking the meat outside. Since it was winter, the windows were closed. Because the crockpot was warming the house, the HVAC wasn't running. Both of these facts contributed towards creating a bad air situation, all from one electronic crockpot! Cooking with oils will release PM2.5 before smoke is visible. It's wise to pay attention to smoking points, and be conservative. Coconut oil, with all of its hype, can be particularly bad for the air when used for cooking eggs, tortillas, or other things in a skillet! We've started to prefer grape seed oil, instead, which is more stable at higher heats. When cooking things in a fry pan, I've found it is better to target lower temperatures when possible. 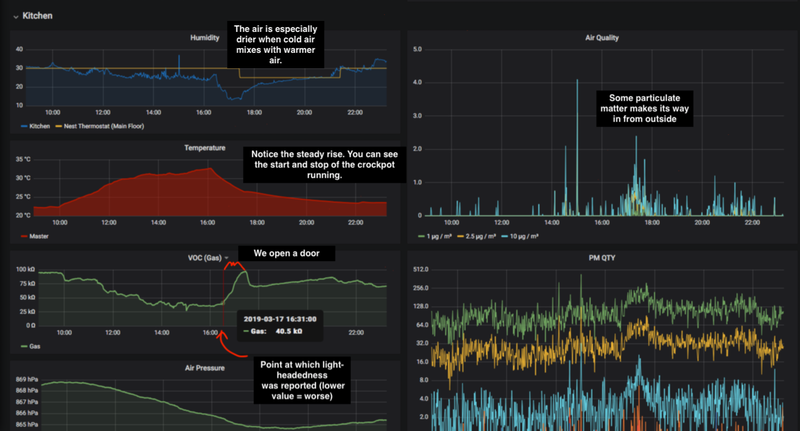 Even when running the hood-range over my stove, if the oil starts to smoke even a little bit, then I either need to open some windows or deal with the fact that my home is going to be full of pollution for several hours. That nice smelling candle can be a big offender for releasing both VOCs and PMs ! What looks like a little bit of smoke can actually be really hazardous if not ventilated well. 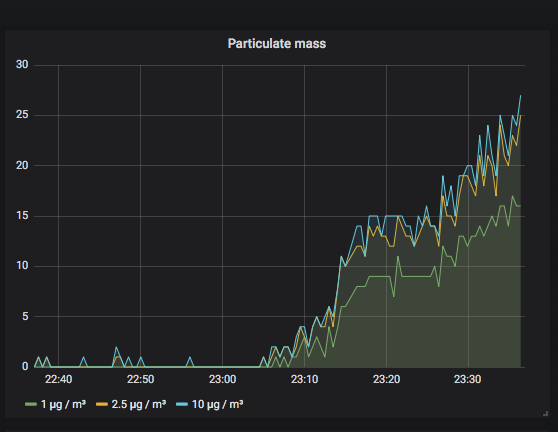 One time, I blew out several candles in a room that was poorly ventilated, and watched my PM2.5 levels climbed all the way to 70 μg / m³, a level that is considered hazardous for long-term exposure. It's very easy to make your indoor air worse than outdoor air. Indoor air is super important and I wonder how many people really think about it! If you are not mindful of it, then your indoor air can be worse than the air outside on a bad air quality day! When it comes to supporting good health, we should be as concerned about the air we breath as with the food we eat! I'm under the opinion that monitoring your indoor air quality should be a more common thing, especially in families with asthma sufferers. Having the raw values helps to answer the question, "is my indoor air quality currently bad?" Having a history of the values via graphs has really helped me to answer the questions, "why is my indoor air currently bad? And, what was the air quality like in the several hours leading up to this air-quality reaction?". Bureau of Epidemiology. "Air Pollution and Public Health in Utah - Particulate Matter (PM)." Utah.gov, http://www.health.utah.gov/utahair/pollutants/PM/. Accessed 2019-03-20. Jeong-Hyeon, AhnKi-Hyun, KimYong-Hyun, KimBo-WonKim. "Characterization of hazardous and odorous volatiles emitted from scented candles before lighting and when lit." ScienceDirect. https://www.ncbi.nlm.nih.gov/pubmed/25588193. Accessed 2019-03-20. The National Ambient Air Quality Standards for Particle Pollution. "REVISED AIR QUALITY STANDARDS FOR PARTICLE POLLUTION AND UPDATES TO THE AIR QUALITY INDEX (AQI)." Epa.gov, https://www.epa.gov/sites/production/files/2016-04/documents/2012_aqi_factsheet.pdf. Accessed 2019-04-05.